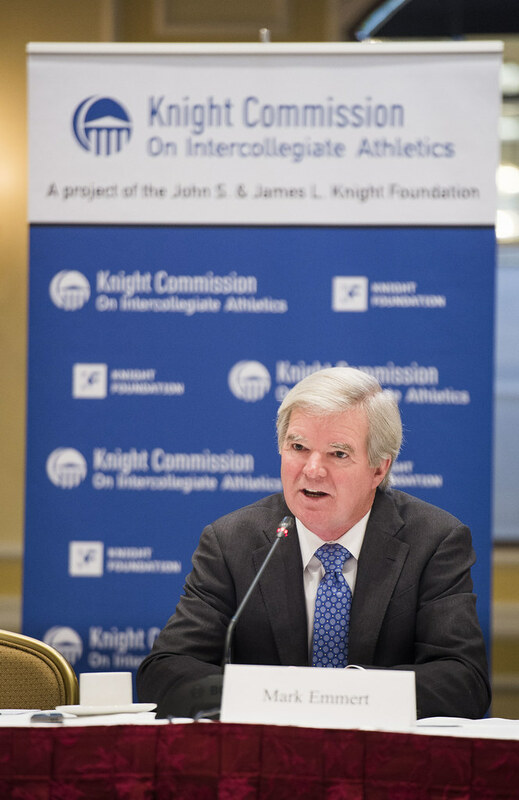 Washington, D.C. —The Knight Commission on Intercollegiate Athletics said today that recent college sports scandals have threatened not only the integrity of intercollegiate athletics but raised basic questions about the NCAA’s ability to prevent abuses, protect the rights of athletes, and clean up corruption. 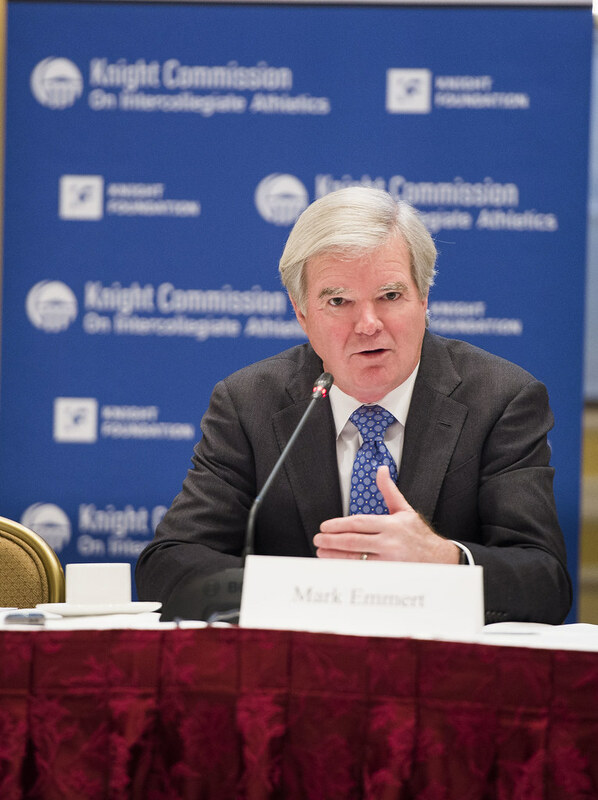 Emmert acknowledged that the schools have a public trust problem. 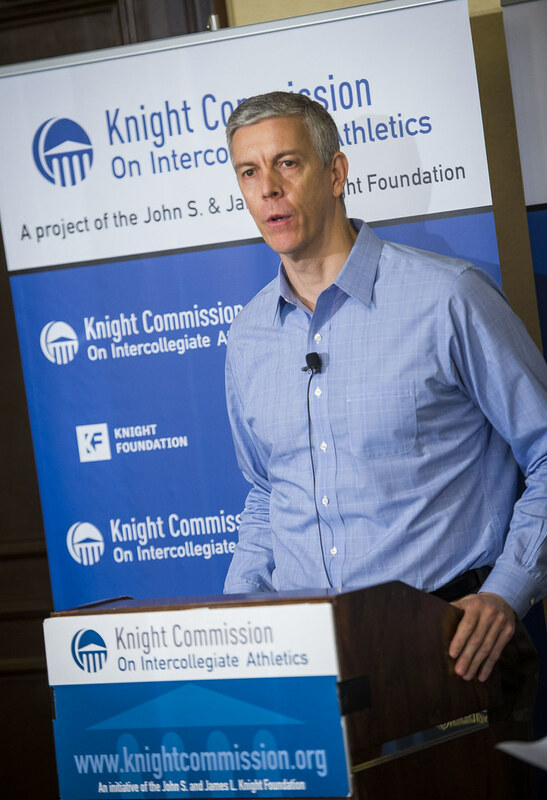 He said recent NCAA polling showed that nearly 80 percent of people believed “big universities put money ahead of their student-athletes,” and that nearly 70 percent of big schools are part of the problem, not the solution. Federal bribery and fraud charges were brought last month against 10 men, including four assistant coaches and an Adidas official. 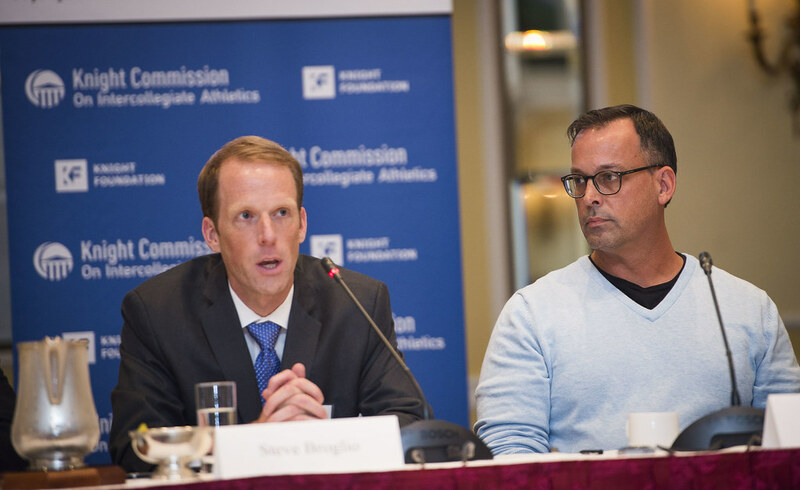 The Commission believes that the basketball scandals are symptomatic of broader, systemic problems in men’s Division I basketball and FBS football. 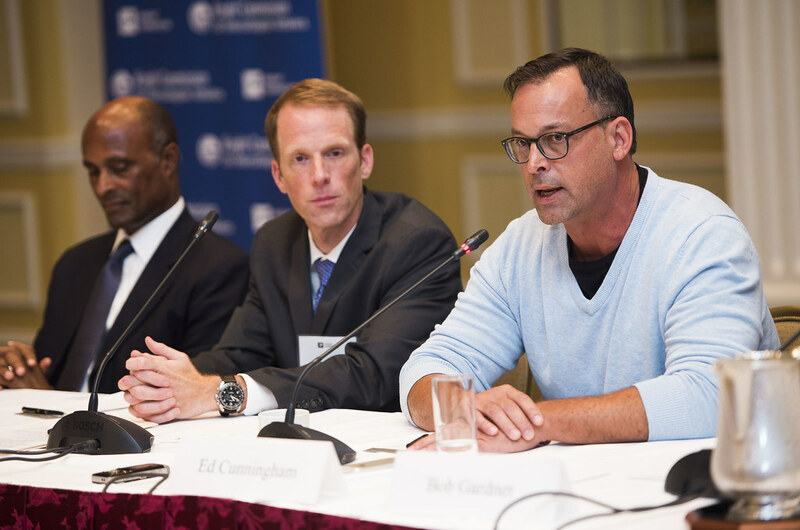 NCAA enforcement and compliance tools and practices have consistently failed to uncover the type of behaviors exposed in the federal investigation. 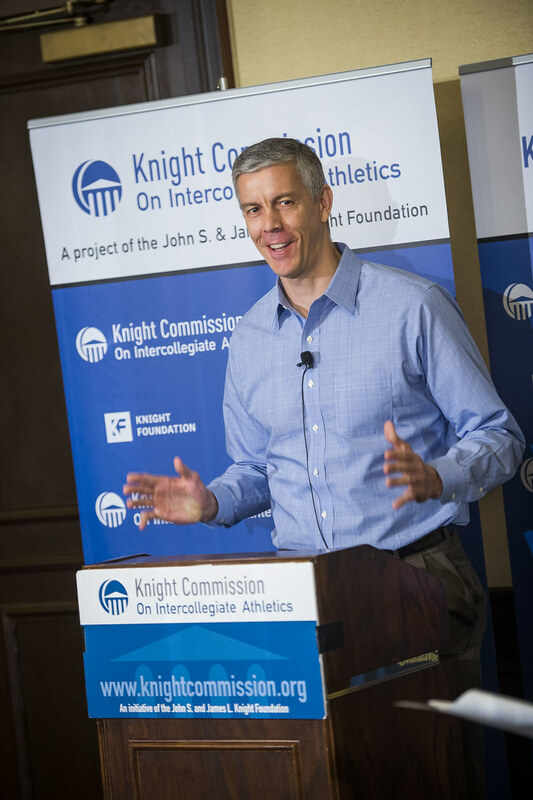 Yet these alleged illegal acts have been rumored for years, fostering a recruiting culture in Division I men’s basketball that too often crosses the line into corruption. 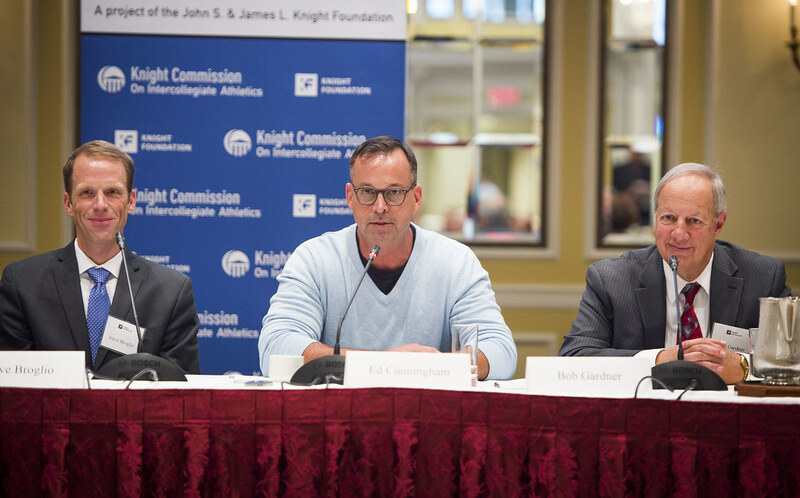 The Commission meeting highlighted several broad areas of Division I basketball in need of far-reaching reform: Exploitation of college athletes by shoe companies and agents; the largely unregulated structure of non-scholastic youth basketball and its recruiting culture; and changes to the NCAA’s compliance and enforcement powers. 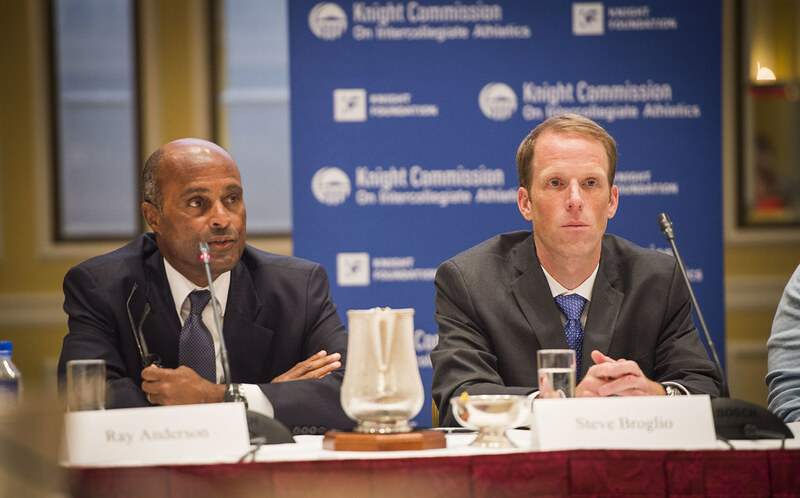 Among other changes the Knight Commission will explore are expanding the range of practices and tools for NCAA investigations, including subpoena power. 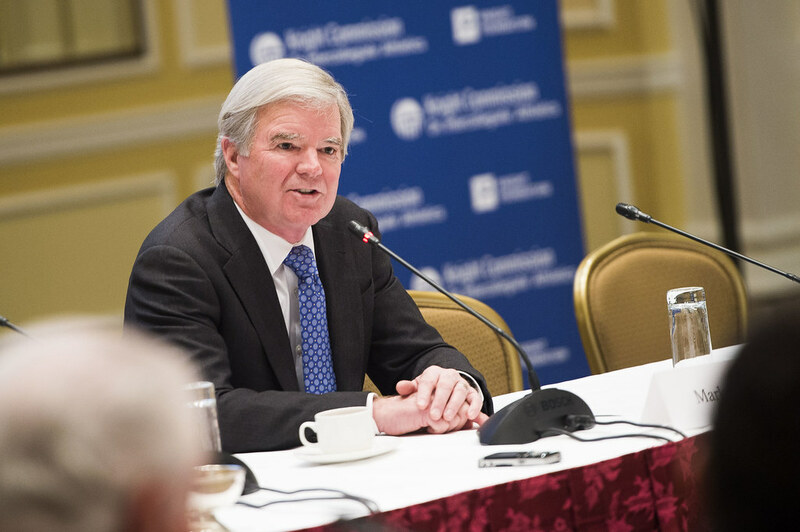 The Commission commended the NCAA for creating an independent Commission on College Basketball, chaired by Dr. Condoleezza Rice, former Stanford University provost and U.S. Secretary of State. 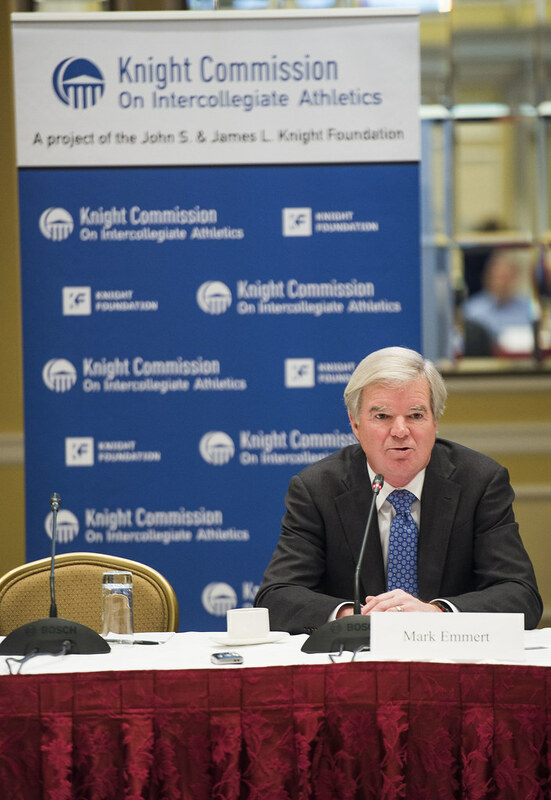 The Knight Commission, which has a long history of providing recommendations that have improved the integrity of college sports, will seek to meet with the basketball commission to outline reforms to protect the educational mission of college sports and reduce the exploitation of student athletes. 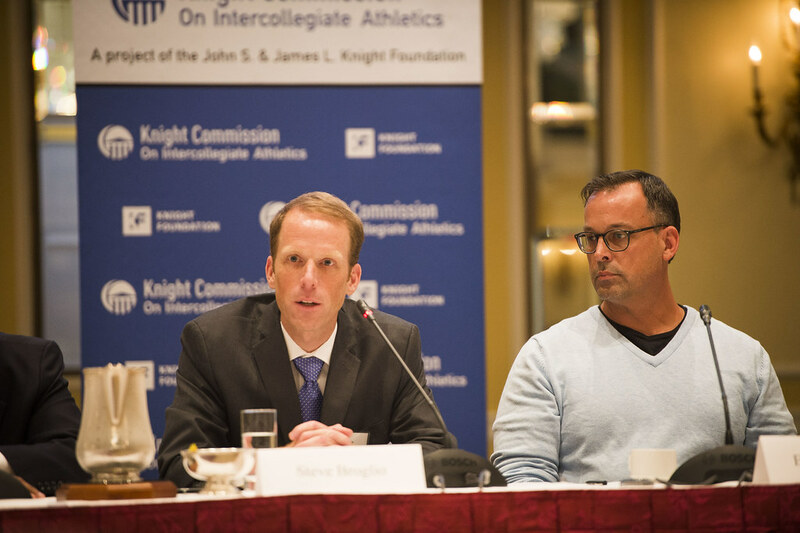 Today’s meeting also focused on other core principles at risk in college sports, including protecting the health and safety of athletes. 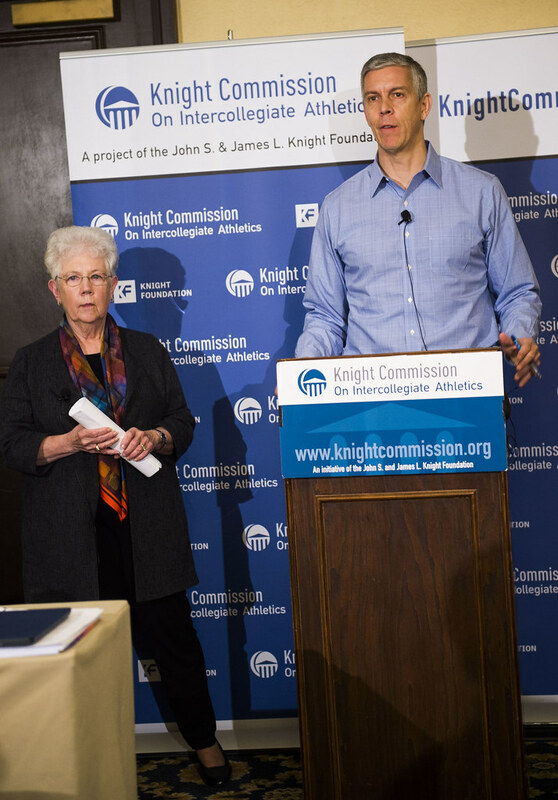 The Knight Commission reiterated its recommendation to the Board of Managers for the College Football Playoff to provide leadership by directing a portion of its more than $400 million in playoff revenues to address national health and safety initiatives for football players. 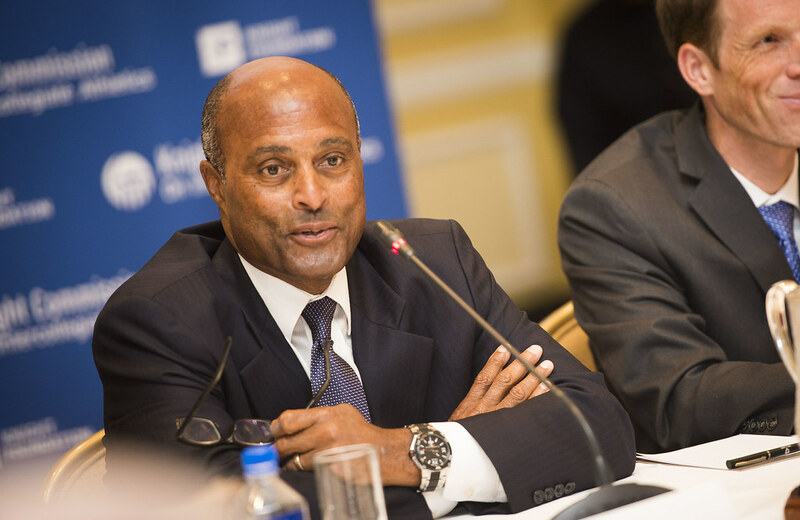 The Commission urged the CFP Board of Managers to act on these recommendations at their meeting next January. 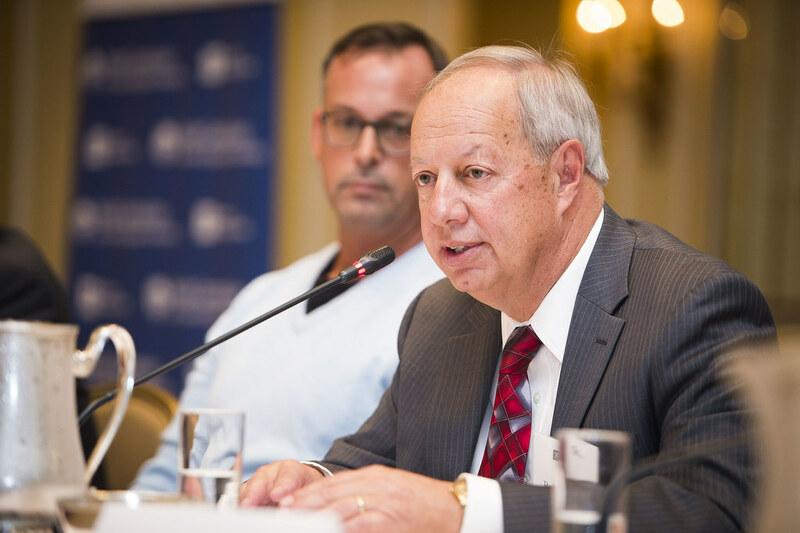 One of today’s panelists, former ESPN and ABC football analyst Ed Cunningham, said the CFP should approve what he called a “modest recommendation” from the Knight Commission. “Just say yes to that,” he said. Last week, the NCAA, which does not receive money from the College Football Playoff, announced an additional commitment of $12.5 million for concussion research. 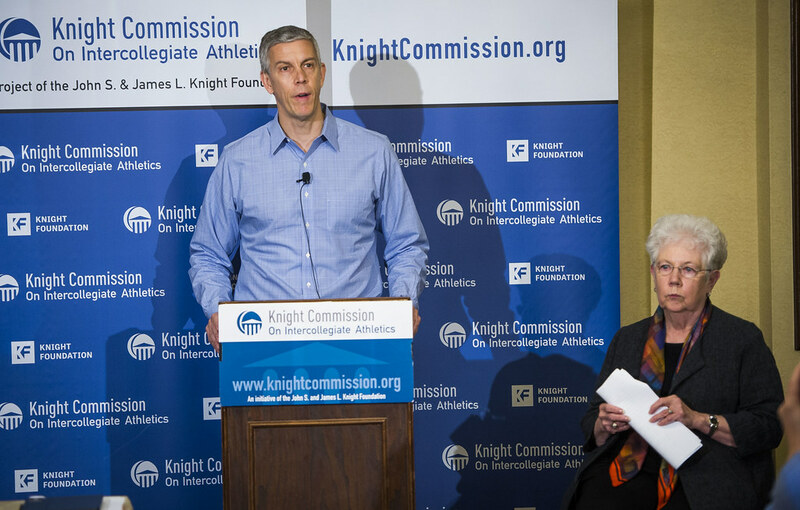 The Commission called on the NCAA to modify a rule that now effectively allows an institution under investigation to make its own determination about the academic legitimacy of its courses. 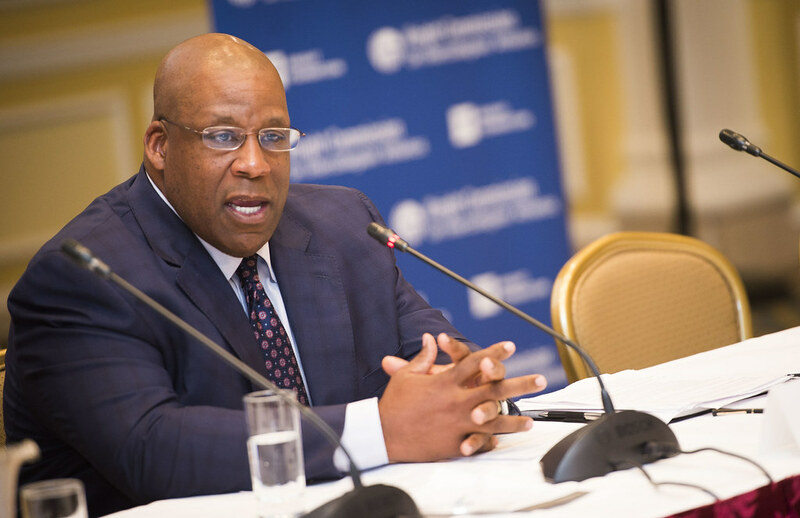 The NCAA should not be handcuffed in its authority to consider independent assessments of academic fraud, such as those made by accrediting agencies and state licensing bodies. 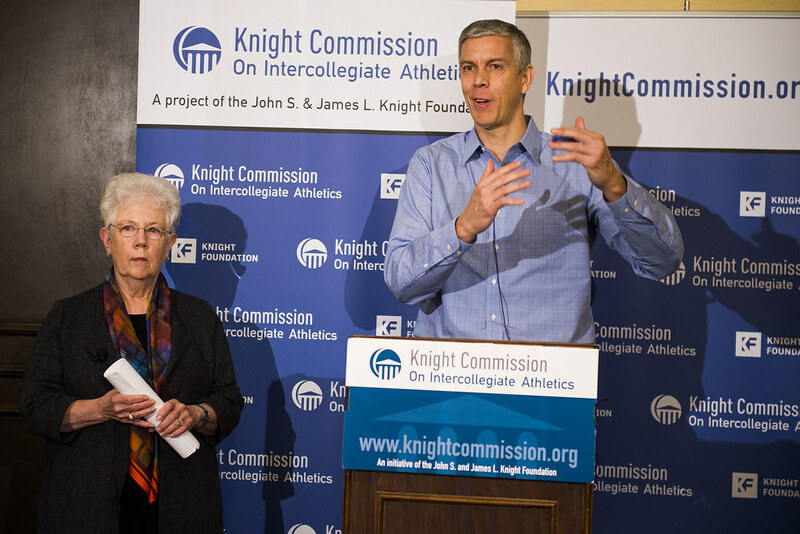 Other loopholes in NCAA rules governing academic integrity, including the determination of what constitutes impermissible academic benefits for athletes, also need to be closed. 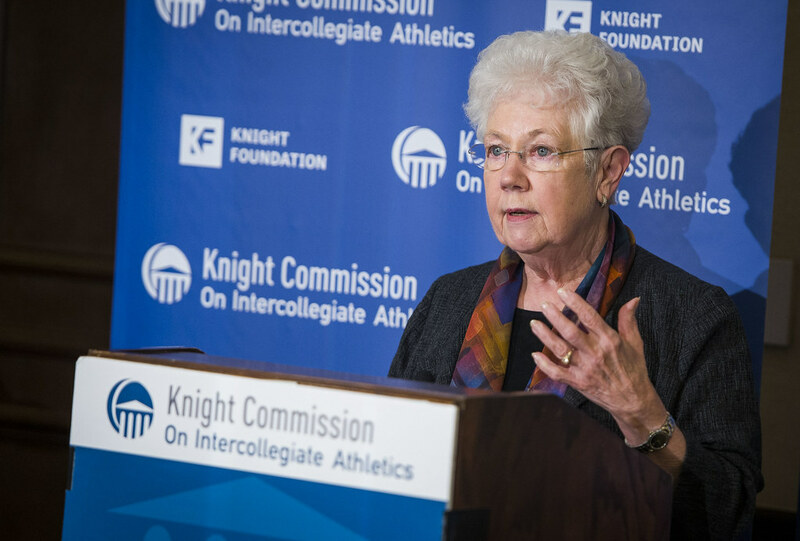 “It’s clear that we need a new approach that can provide more fairness to student-athletes, while giving more teeth to the NCAA to ensure academic integrity in college sports,” said Carol Cartwright, co-chair of the Knight Commission and president emeritus of Kent State University. 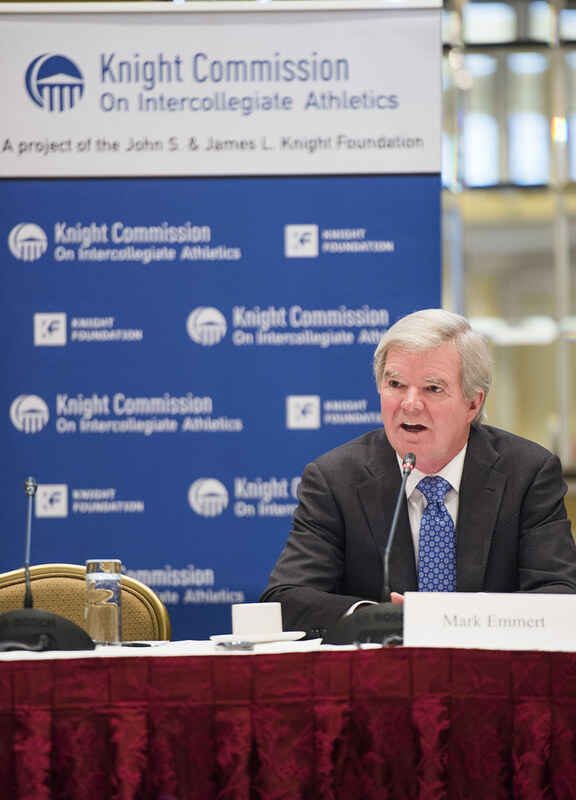 The Commission plans to continue its exploration of other reform ideas – including how a limited antitrust exemption for the NCAA, with restrictions, might address current problems, and whether financial benefits could be provided to players for the use of their names, images, and likenesses. These issues have been studied and discussed in prior Commission meetings, such as those in May 2015 and May 2016. The Commission will also be studying and monitoring reforms to improve the integrity and fairness of the transfer process. 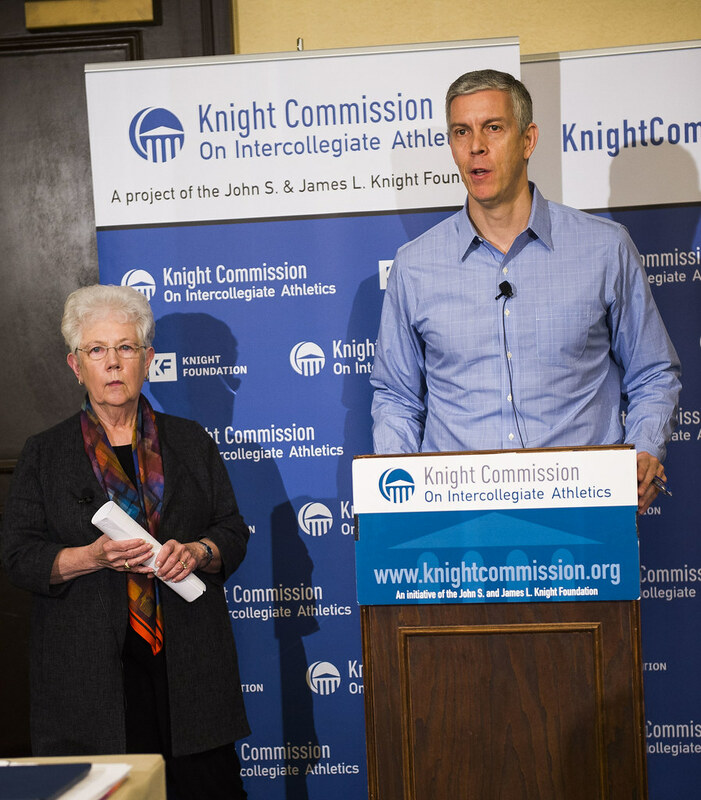 Finally, the Commission recommended that all NCAA athletics programs be required to publish gender and racial diversity data on their department’s administrators, coaches, and athletes, similar to annual disclosures on graduation rates and gender equity. The Commission was pleased to get a positive response from the NCAA to its Aug. 4 request to reverse a recent change in financial reporting requirements that had eliminated transparency for bonuses paid to college football coaches by grouping them with dissimilar postseason expenses. The change will require separate reporting for the bonuses paid to college football coaches for postseason appearances and wins. 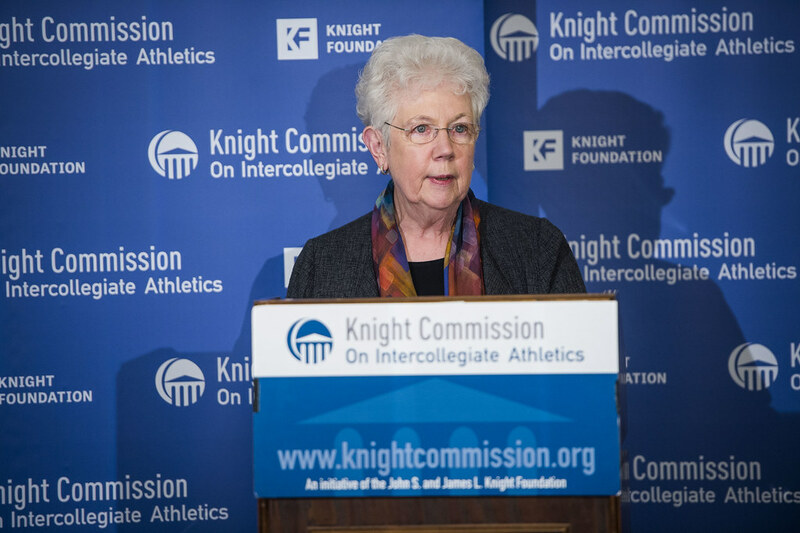 The Knight Commission recognized four members who are completing their terms of service and have made substantial contributions to the group’s efforts: Val Ackerman, Len Elmore, Janet Hill and Sarah Lowe. 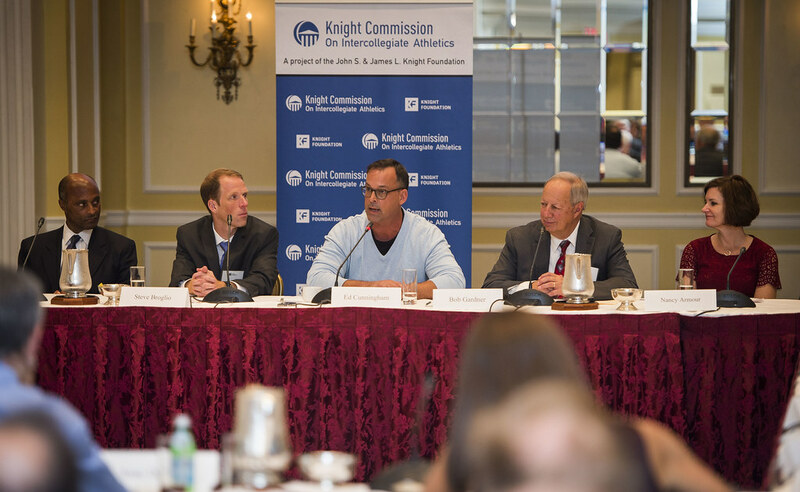 October 30, 2017 meeting of Knight Commission on Intercollegiate Athletics. Washington, DC. 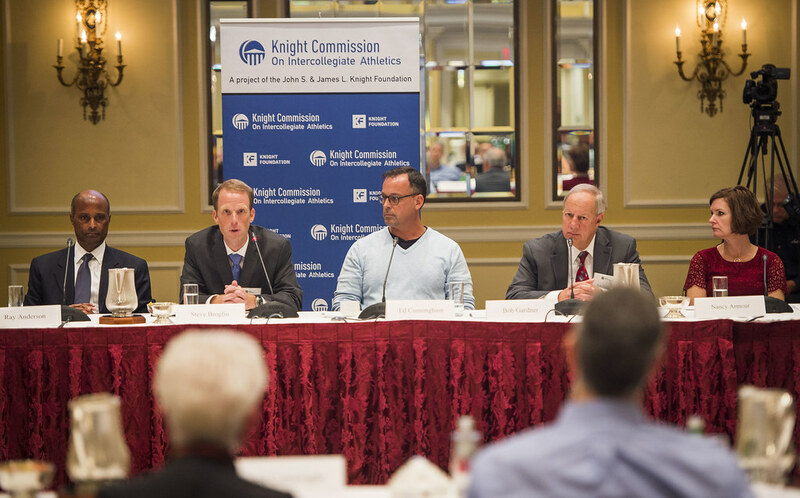 October 2017 meeting, Knight Commission on Intercollegiate Athletics. Washington, DC.